Aaron Rodgers threw for 209 yards and two touchdowns, and the Packers pulled away from the Texans with two fourth-quarter touchdowns for a 21-13 win Sunday to get back to .500. The Packers (6-6) weathered snowy conditions at Lambeau Field, making just enough plays on the cold turf to even their record for the first time since they were 4-4 after losing to Indianapolis on Nov. 6. “Well, that was a good bad-weather win. A lot of fun to play in that type of atmosphere in Lambeau Field,” coach Mike McCarthy said. 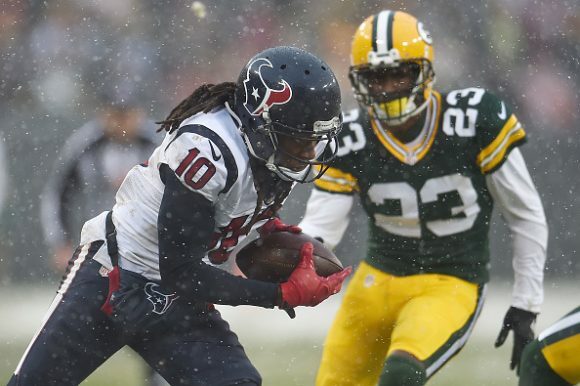 The Texans (6-6) had one last shot after the Packers failed to run out the clock. But Osweiler’s last-ditch pass-and-lateral play from Houston’s 12 with 4 seconds left failed, handing Houston its third straight loss.